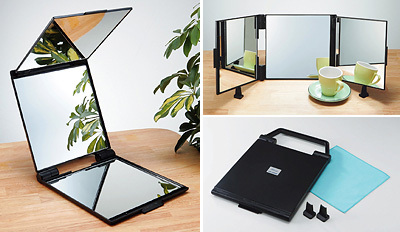 This portable for panel mirror can be folded compactly. 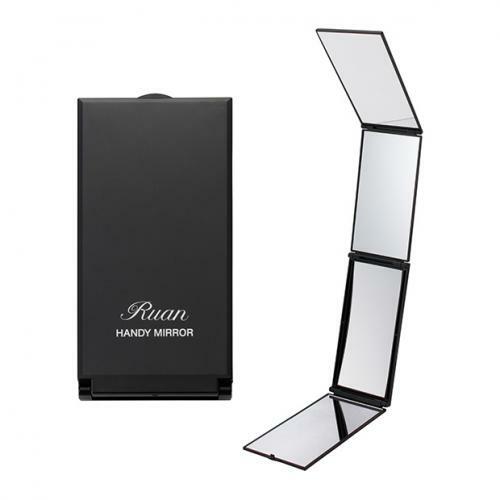 It comes with a concave mirror convenient for magnification. While holding the mirror firmly,adjust the angle to a position at which it is easy to see the top of the scalp. The top of the scalp can be seen by looking at the bottom panel. 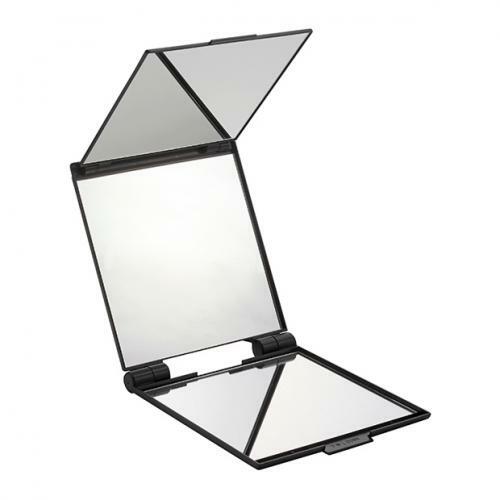 When putting on makeup, look at concave mirror on the front to see yourself magnified. (4)1 micro-fiber cloth for cleaning your mirror. you want to see the top of your head. taking off hair piecces, setting, or dyeing your hair. Adjust the angle so that it shows the top of your head. If the top and front mirrors are adjusted too far back, the mirror will eventually fall outward. The bottom side mirror shows the top of your head. The hair on the top of your head is shown in the bottom mirror. Adjust the angle to see the top of your head. When using the mirror for general use, put CUBIC MIRROR sideways by adjusting the angles. You can see the side of your face and ears which cannot be seen when using standard handheld mirrors. Slide the holder to an angle that can show your face better. If the top hinges get loose, tighten both the right and left hinges equally with a Philips-head screwdriver. Note: Do NOT tighten too much. Over tightening may break the mirror.